Someone asked me recently what I saw as common between using hand planes and woodturning, and it occurred to me that there are quite a few aspects of the two disciplines that are somewhat similar. The first and perhaps most important, in my view, is sharpening. If the user struggles with sharpening, they will likely never excel in either discipline. Finding a way to get a consistently super sharp edge can make all of the difference. The next on my list is learning touch. There are many times a customer will pick up one of our planes that is already setup, and seem to struggle a bit. When I come over and show them a better way to possibly hold the tool, or stance, or using the legs to drive the tool, then they start to have better results. Some folks seem to think a hand plane is only capable of taking the same thickness shaving as long as the iron is set at the same depth. I can take the same plane, and without changing the setting, modify the cut in different touch related ways, from skewing the plane to applying different pressure on different areas. The touch thing is even more important in the turning world. Turners that are still learning (that’s me) can make the tools cut, but those with elevated skills can take the same tool and make it sing. 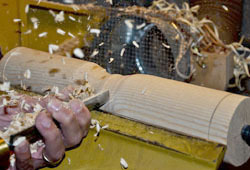 It is a very, very important aspect of turning. The last of my thoughts relates to the quality of the tools used. Now, there is nothing to say that you have to go out and buy the most expensive planes or turning tools, in order to do good work. Not at all. But I would suggest examining what you buy to make sure it is made well. When I first started out, I bought a brand new Sears hand plane for about $20 (this was a long time ago). It looked ok, but the iron material was such that it just never would hold an edge. Beyond that, the plane body was flexible (not a good thing in this work), so the flexing would change the iron’s depth and it was a continuous struggle. Soon afterwards, I bought a second hand Stanley hand plane from the 1930s, that had no flex and the iron would sharpen easily. I think I paid $5 for this plane. It worked much better than my first. 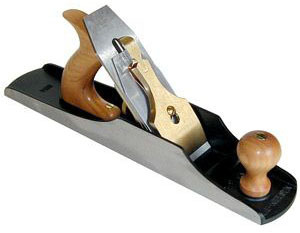 Then when I put my hands on my first Lie-Nielsen plane, I wondered how I’d got along with just my old Stanley. Point is, a decently made plane is something you can work with. A better made plane (stiffer, more mass, better materials) seems to provide a better control over the wood. I believe that is primarily due to consistency of the tool, in all manners, while you work. If the tool is not completely static, then you have to modify your “touch” during your work, which just tosses in more barriers to doing your best work. On the turning side, well made tools may come down to the metals used in their making. Some of the early turning tools were made of metals that would both hold an edge for a short time, and were prone to quick damage during grinding, as a relatively low heat would cause loss of temper, and that means the steel won’t hold an edge. Some of the better tool steels are much better at both aspects. Some can become quite expensive, but again you can get by with the old steels, as long as you don’t mind sharpening frequently and are extremely careful when grinding, using a very light touch.